Privacy? Forget it. A comfy place to sleep? Nope. Bathroom? Behind the nearest bush – if you could find one. 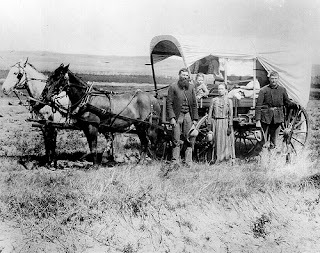 Such were comforts of home in a covered wagon. When teens were traveling, either with their families, or as pioneers in their own right, they often made the long trek across country in a wooden wagon covered with a canvas top and pulled by horses, mules or oxen. Covered wagons were also known as the Conestoga wagon, a big wagon used in the East, or a prairie schooner because they looked like a sailing ship moving across the plain. Depending on where the journey began and the final destination, the covered wagon could serve as home for as long as six months, sometimes longer if it was used as temporary housing until a more permanent shelter could be constructed. What, then, was it like to live in the pioneer version of a mobile home? Most of the time sleeping, eating, cooking, and just about everything else (including potty breaks) was done outside. Folks slept under the wagon or in tents. If the weather was bad, they slept in the wagon box or on top of the load that was packed inside. Most of the time, the people walked rather than rode along with their animals: a cow, spare horses, a dog. There was little protection from the weather, almost no protection from attackers, no heat except for a fire, no air conditioning except for the wind, no water except what could be carried until a new source was found, no hospitals, no phones, no nothing. Such great and courageous people to make a journey in a covered wagon!